Transformers fan in Singapore listen up. ToysRus is having a Midnight launch for the up coming movie figures, Transformers: Revenge of the Fallen. The movie toys will be officially on sales at 30 May 2009 midnight 00:01 hours at ToysRus at Forum shopping mall. The first 200 in queue will get a guidebook of the executive Transformers: Revenge of the Fallen. 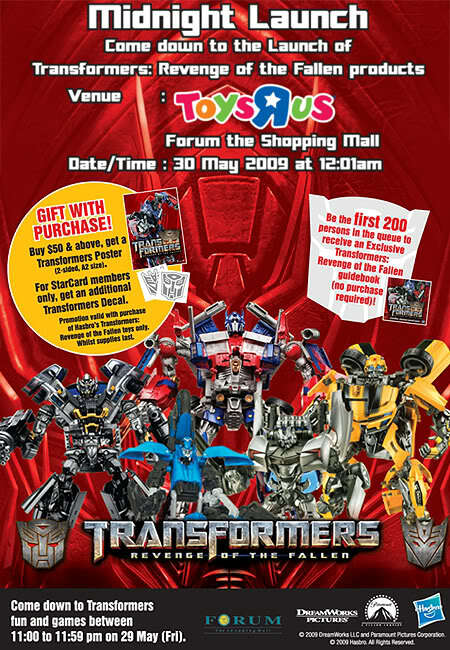 A A2 size 2-sided poster with Optimus Prime will be given to those who spend over S$50. On top of that, if you are a ToysRus star member, you will get a additional transformers Decal (good to paste on your car). So will you be an Autobot or Decepticon? It is certainly something to look forward to especially for those TGIF night owl transformers fan who complain there is nothing to do on Friday night. So go rush and get the toys first for those who can't wait. Remember to be nice to each other that day okay? Great piece of intel bro! Luckily I stopped collecting Transformers, or else it going to be spend, spend & spend. Hee! Hee! I agree with desmond. I find TakaraTomy Version having better paint job and plastic quality.